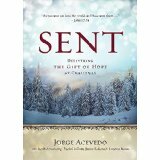 Join us each Monday in Advent beginning November 30 for a study of the book, Sent: Delivering the Gift of Hope at Christmas. We will meet at 10 a.m. at the parsonage in Comer and at 7 p.m. at Colbert. This entry was posted in Uncategorized by colbertumc. Bookmark the permalink.